With the holiday season approaching, its a great opportunity to experiment with a festive beer. Spices, fruits and hop additions can all be combined to brew the perfect holiday ale or lager. Often called a Christmas, Winter or Holiday beer, these beers often include spices such as nutmeg, sugars, mulling spices, ginger or cookie flavors. The new BJCP 2015 style guide includes category 30C (old category 21B) that defines the holiday/winter beer style. The style is closely tied to the flavors and aromas of the Christmas season. Aromatics are particularly important for this style including aromatic hops, nutmeg, ginger, allspice, cloves, cinnamon, mulling spices, sugar, caramel, pudding, evergreen trees, cookies and aromas associated with holiday desserts. Fruits are also popular including oranges, lemons, currants, and berries. Flavorful sugars such as molasses, tracle, invert, brown sugar, maple, pumpkin and honey are also often used. The beer itself is often strong, dark and has a rich body that warms the drinker and complements the spices. For BJCP competition a base style should be declared as well as the spices and additions used. Because the base style can vary, holiday ales encompass a wide variety of original gravities, hop levels and color, though most holiday ales tend to be slightly higher in alcohol and warmer in body to reflect a warming drink for the cold winter season. All winter beers start with the choice of a base beer. The base beer can vary widely. For spiced beer it is often a moderately dark, alcoholic beer (often an Old Ale) that is well hopped and provides warmth, good body and some complexity of flavor to complement the cold weather and choice of spices. These beers are often built on an American or Belgian base style US and Belgian brewers often use spices in regular brewing. In contrast, fruit based winter beers often use a light wheat base and low hop rates so the flavor of the fruit will come through and be properly accented. The key is to choose a beer that complements and does not distract from your choice of adjuncts. Since the spices and adjuncts use vary widely it is difficult to identify a single magic formula for the perfect winter ale. Two overriding principles serve as a useful guide: First – have an overarching theme/goal for your beer to aid in choosing ingredients and second – moderate your adjuncts. Setting an objective for your holiday ale is important. For example, if you want to brew a beer reflecting the flavors of a sugar cookie you might start with a robust body ale, and then add sugar or possibly even a small amount of lactic acid or maple sugar to provide warmth and sweetness. A small amount of nutmeg would be an appropriate spice to reflect the flavor of the cookie. In contrast, a gingerbread beer would use an entirely different base and set of spices – likely incorporating ginger, molasses, cloves and bready specialty malts. Equally important is the concept of simplicity and moderation when using adjuncts. Many first time holiday brewers go overboard with spices or adjuncts and add too much – overwhelming the base beer rather than accenting it. Many also try to throw too many spices or flavors into the beer, muddying the final effect and producing a flavorful mess. The combinations that go best together are those that reflect the flavors of the holiday. Bitter orange peel and cloves, cinnamon and apples, mulling spices and a warm dark beer, fruits to match the spice, etc… You can even use fruity or piney American hops that complement your choice of holiday spices. 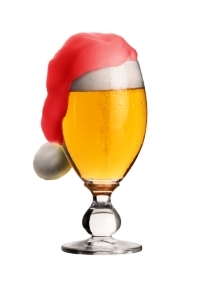 I hope you have a great holiday and get a chance to experiment with some good holiday beer recipes! Thanks for joining me on the BeerSmith Home Brewing Blog. You can grab a trial version of BeerSmith from BeerSmith.com. Be sure to sign up for my newsletter or my podcast (also on itunes…and youtube…and streaming radio station) for more great tips on homebrewing.